Ever try to decipher the different types of life insurance? Term, Permanent, Variable Universal—if you’re a little intimidated by all types and terms, take heart—you’re far from alone. Let’s look at two common types of life insurance, Whole and Universal life insurance. Let’s learn about each and figure out if one—or neither—are right for you. Whole and Universal life insurance fall into the same category—Permanent life policies. These policies have two main parts—and investment portion and an insurance portion. A portion of your premium funds the policy just like it would in a health, auto, or homeowners insurance policy. The rest of your premium is invested by your insurance company and those investment gains build up your cash value. You can take policy loans against your cash value, use it to pay your premium if life events leave you in a financially difficult position, or it becomes part of the payout when the policy later pays out to your beneficiaries. Because permanent life policies have the cash value component, the monthly premiums can be quite high and if the policy is cancelled, you will get the cash value of your policy paid to you. Like most other forms of insurance, permanent life insurance may be used as income replacement, especially if you’re the primary source of income and pass away relatively young, estate planning, and as a steady stream of income later in life if the cash value of the policy is high enough. Now that we know the similarities, let’s look at how they’re different. Do you know somebody who likes things very black and white? Nothing changes, no variations, and very specific rules are kept in place regardless of the circumstances? Or maybe that’s you! Regardless, that person would identify with whole life policies. 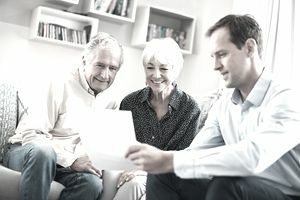 Whole life policies stay with you for life and pay out to the beneficiary or beneficiaries upon your death—or, in the case of most insurance companies, age 100—whichever comes first. Your monthly premium and the death benefit will not change once you sign the paperwork. Much like that black and white friend, the policy is very predictable. If you’re 45 years old and want a policy that pays $500,000 upon your death, you would apply, probably complete a medical exam, and receive a monthly premium that you pay for life. When you pass away, the people you listed as the beneficiaries will receive their portion of the $500,000. Because of the predictability of the policy, insurance companies don’t invest the cash value of the policy into the stock market. Instead, the cash value rises based on more conservative investing that produce dividends and interest. If you’re not a schedule person and more of a “fly by the seat of your pants” type, or you know somebody who is, they would identify well with Universal life insurance. Universal life gives you flexibility in the premium payments and the duration of the policy but with that flexibility comes unknowns. Premiums may be lower during periods of high overall interest rates and higher in low interest rate environments to account for the lower gains on the cash value of the policy. If things get a little financially tight you could decrease your payments which may also decrease the death benefit or you might increase the payment to increase the death benefit based on your financial situation. Some financial advisers frown on the idea of life insurance later in life. They believe that life insurance’s main function is to protect again losing the main source of income and being left with the high costs associated with children, a mortgage and other expenses that are normally higher earlier in life. Once the kids become adults and the mortgage is almost paid off, life insurance becomes less of a necessity. If you or your financial adviser are looking for a way to create a policy that follows that thesis, universal life might be your policy of choice. You could structure your premium and death benefit to be higher earlier and later, when life insurance becomes more of an estate planning tool, reduce the premiums and corresponding death benefit. If you value consistency, and the peace of mind that comes with knowing exactly what your policy will pay out and its overall value 20 or 30 years down the road, you probably want a whole life policy—but keep in mind that those guarantees cost money so the whole life policy will be more expensive. If you want the flexibility of changing your policy as your financial situation changes, and you don’t mind the risk that comes with this flexibility, Universal life is cheaper and gives you more option. Finally, within each of these policies, there are many options that may make these policies look and function like another policy type. Find an insurance broker that you trust and, along with a financial adviser, can structure a policy that meets your needs.